Vestas has launched a research project with local supplier Hvide Sande Shipyard to look develop a new product using drone technology to support blade installation. Windpower Monthly understands the result of the research project will not be a drone itself, but the final product would use the lessons and technology developed with the advancement of Unmanned Aerial Vehicles (UAVs) in recent years. 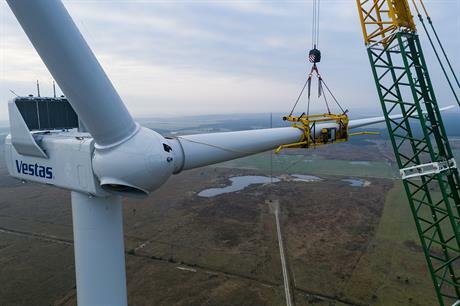 Vestas believes the technology can be used to help stabilise blades during installation to allow blade lifts in harsher weather and reduce the use of taglines. Currently, blade lifts can only take place when the wind is calm enough. And, as blades getting longer — up to 80 metres in some cases — the weather window suitable for blade installation gets smaller. According to Danish newspaper Dagbladet Ringkøbing Skjern, prototypes could be ready by Q3 2019. While Vestas will get sole use of the final project for a short time, Hvide Sande will eventually be able to use it in other industries, such as buildings and infrastructure projects, the paper added. "It is a relatively large sum we're spending spend on this, and I am not sure that we would dare to do so if we did not have this specific task," Thomas Halkjær, head of the technical department Hvide Sande, told DBRS.